CHOISIR (AUS) (Chestnut 1999-Stud 2003). 7 wins-3 at 2, VRC Lightning S., Gr.1. Sire of 1660 rnrs, 1086 wnrs, 92 SW, inc. Olympic Glory (Longchamp Prix Jean-Luc Lagardere, Gr.1), Starspangledbanner, The Mission, Obviously, Sacred Choice, Historian, Choice Bro, The Last Lion, Japonisme, Divine Prophet, Kushadasi, Sir Moments, Dreamscape, Hurried Choice, Glory Awaits, Secret Weapon, Celtic Dancer, Stimulation, Rajasinghe, Chandlery, etc. Kylease (f. by Choisir). Winner. See below. Plucky Lad (g. by Pluck). Placed to 2019, 3d Singapore TC Titanium S., Class 4 H., Class 5 H.
Modern Muse. 2 wins-1 at 2-at 1300m, 1800m, Turffontein Soccer GG H., 3d Vaal Classic Day 28 March H., Turffontein Racing Association H.
Northern Model. 2 wins at 1000m, 1200m, 3d MRC Le Pine Funerals H., Toronado at Swettenham 2YO H., 4th MVRC William Crockett S., L.
Chin Strap. 4 wins to 1300m, A$103,180, to 2017-18, WATC Leith Putland H., Corporate Membership H., 2d WATC Lavazza P., Community TAB 2YO P., 3d WATC Myer Fashion 2YO Trophy, Seacorp 2YO P., Seacorp H., 4th WATC Supremacy S., L.
IMELDA MARY (Ferlax). 3 wins at 1600m, 2000m, NZ$171,850, in 2018-19, ARC Royal S., Gr.2, Waikato RC Sir Tristram Fillies Classic, Gr.2. Reef Beach (Danzero). 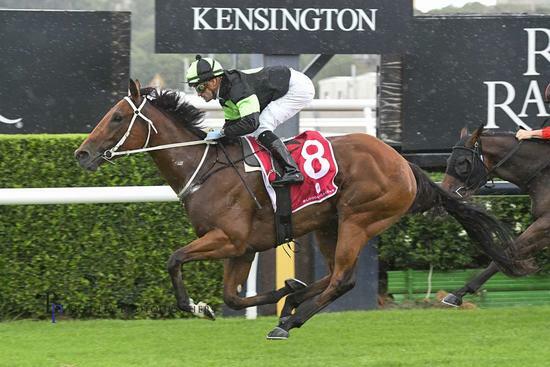 8 wins-1 at 2-from 1500m to 2100m, A$206,150, S$115,480, VRC Shamrock Travel H., MRC Le Pine Funeral Services P.H., Singapore TC Zurich S., MRC Kenvain H., St Jude H., Paris H., MVRC Business Network Luncheon H., 2d VRC Auckland Racing Club H., L, Keith Greig H., MRC Greater Dandenong Chamber of Commerce H., Scobie Breasley H., Always There H., 3d VRC Bridie O'Reilly's Punt H., Comedy King H., MRC Brian Green H., Singapore TC Shin Min Cup. Modellista. 2 wins. See above. RUNWAY STAR (Northern Meteor). 6 wins at 1000m, 1200m, A$386,030, SAJC Proud Miss S., Gr.3, Matrice S., L-twice, ATC Ladbrokes.com.au H., 3d SAJC RN Irwin S., Gr.3. Winner at 1100m in 2018-19, 2d ATC Events by ATC P.